In this article, we will show you, How to Add Row Groups and Column Groups to already created Matrix Reports in SQL Server Reporting Services 2014. 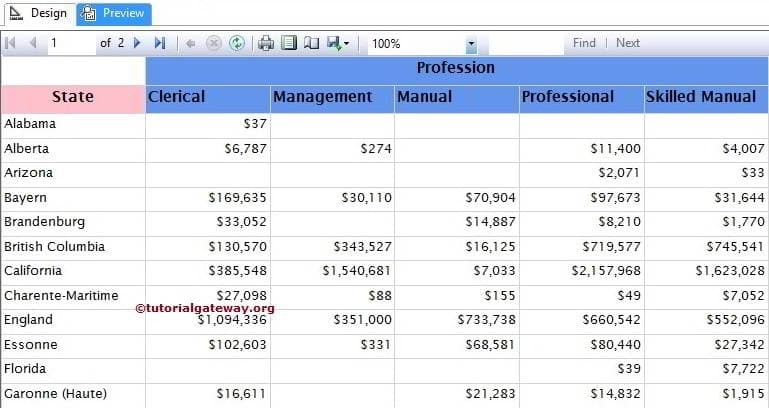 We are going to use the below-shown report to explain, Grouping in SSRS Matrix Reports. Please refer SSRS Matrix Report, Data Source and Dataset articles to understand the creation of Data Source, Dataset and Matrix report. 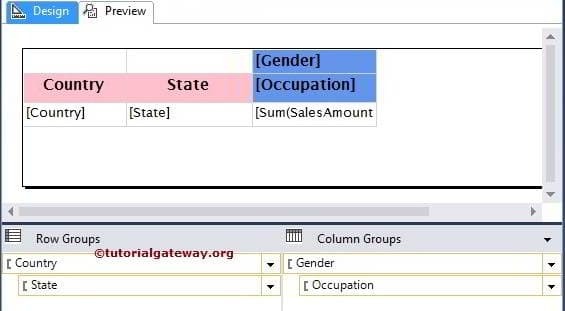 If you observe the below screenshot, It was a normal Matrix report with State Column as Row Group and Occupation as Column Group. We can drag and Drop the Column name from Report data to the Row Grouping Pane or Column Grouping Pane in the position we want. For example, Drop the column name on top of the existing group to add parent grouping. We can Drag the Column name from Report data to the Row Grouping or Column Grouping Column. 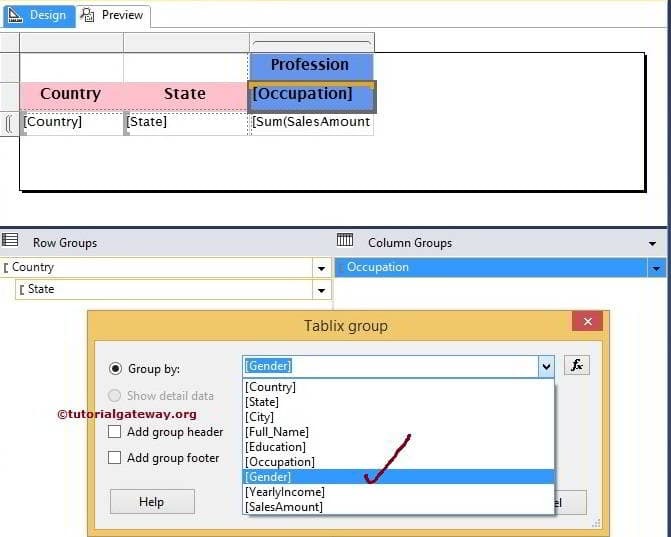 For example, Drop the column name beside the existing group to add parent grouping as shown below. NOTE: It is not a good practice to use the above method. Because if you change the direction of a Blue bar, it will give the wrong result. 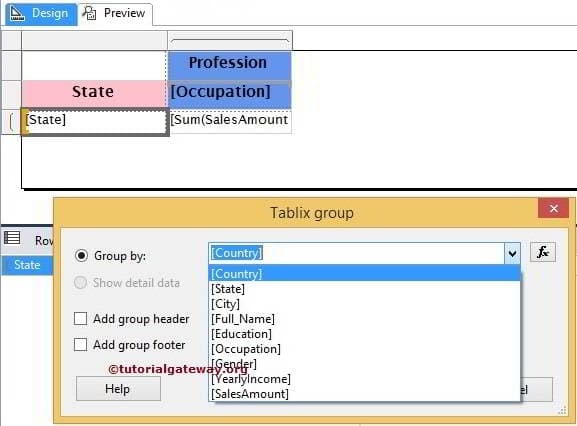 The third method, go to Row groups pane and right-click on the State Group will open the context menu. 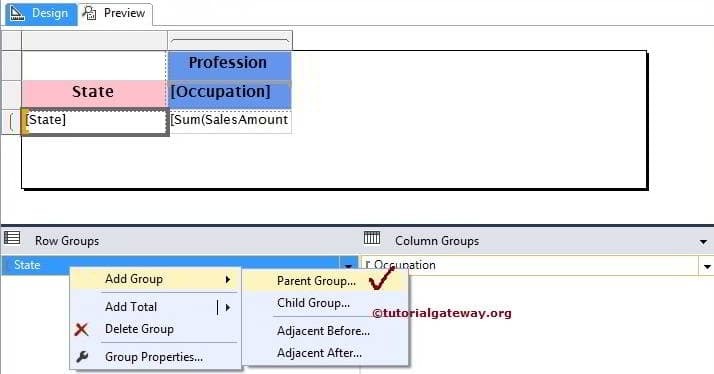 From the context, Please select Add Group and then select the Parent Group option as shown in below screenshot (If you want to add child group, select Child Group option). Once you select the Parent Group option, a new Tablix group window will be opened to configure the grouping. Click Ok to finish Adding Row Grouping to existing SSRS Matrix. 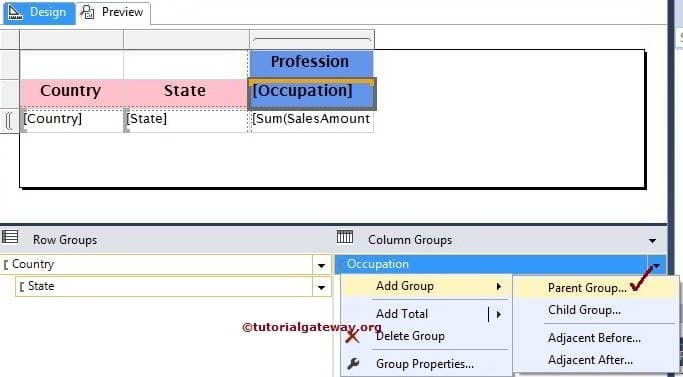 Goto Column groups pane and right-click on the Occupation Group will open the context menu. From the context, Please select Add Group and then select the Parent Group option as shown in below screenshot. If you want to add child group, select Child Group option. Click Ok to finish Adding Column Grouping to existing SSRS Matrix. From the below screenshot, You can see that we added Row groups and Column Groups to existing Matrix and we also did some Formatting as well.